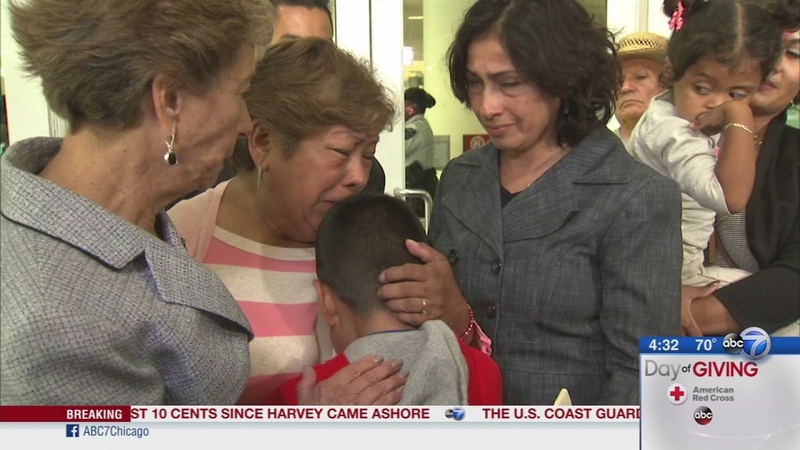 CHICAGO (WLS) -- A 67-year-old Mexican immigrant woman facing deportation next month has filed a federal lawsuit claiming a pending application for a special category of visas granted to crime victims should allow her to stay. Genoveva Ramirez Laguna, who came to the U.S. in 2001, is living in the country without legal permission. The complaint filed Monday says she was the victim of a 2015 assault and cooperated with police in the investigation. She's applied for a U visa. Attorneys say processing the application could take years and argue her deportation should be on hold pending the outcome. The lawsuit names agencies including Immigration and Customs and Enforcement, which declined comment. Laguna is an activist and grandmother whose case is supported by several Democrats including U.S. Reps. Luis Gutierrez and Jan Schakowsky. Ramirez, of Berwyn, is an undocumented immigrant who has lived in the U.S. for 16 years. During an appointment on Thursday, immigration officials told Ramirez that she must leave the country by the end of October. Ramirez was involved in a traffic stop four years ago that revealed her immigration status to officials. Under the Obama administration, Ramirez was granted permission to stay in the U.S. twice. A third request, filed in the summer of 2017, was denied. "This is a ramping up of the effort by the Trump administration," Cook County Commissioner Chuy Garcia said. "It's sort of blind through the humanitarian situations." Ramirez has two children and eight grandchildren in the U.S. Her grandson wept in her arms when it became clear that she would be deported. "She's going to keep fighting and she's going to hope until the end," Ramirez said through a translator. "She's not going to give up." "We believe there is enough discretion to decide that this valuable person in our community should be allowed to stay," Schakowsky said. Ramirez has pleaded with the immigration officers and told them that the decision would separate her family, to no avail. "It's just inhumane how they're doing this," Alderman Richard Munoz (22nd Ward) said. Ramirez must report back to immigration officials on September 28 with a plane or bus ticket to prove that she will leave the country by the end of October. Schakowsky and immigration officials said they would continue to fight on Ramirez's behalf.